Join the multitude of Cooking for Chemo lovers and you too will be saying incredibly wonderful things like this. Thanks so much Kim! Hydration: Ingest lots of fluids especially during cancer treatment! Dehydration is no joke! Water regulates many functions of your body including food digestion, muscle movement, and how you taste flavor. There are many ways to get water into your body during cancer treatment: sports drinks, soup, vegetables, fruits, food in general, or even drinking plain old water. Roundness of Flavor: In short, this is the key to cooking for cancer patients going through chemotherapy treatments. Roundness of Flavor is my cooking theory that encompasses every aspect of the actual tasting experience. When you eat food, you experience food with all of your senses not just your mouth. Roundness of Flavor is a holistic view of eating that teaches you to find all five flavors that you taste (salty, savory, spicy, sour and sweet) and experiences (touch, taste, smell, sight, and hearing) and bring them into balance. When your sense of taste and smell come out of balance during cancer treatment, you have to find which aspect of the sense has come out of balance and compensate to bring balance back to your body. For example, if you are extra salt sensitive with food during chemotherapy you will reduce the salt content of a meal, but increase the savory or spicy characteristics of your food to bring balance to your recipe. The cheat sheet below is a good go-to guide when you are cooking our easy recipes. Simply taste your recipe, evaluate what flavor it is missing, and then season your food in order with the suggested ingredients to bring your food to life. 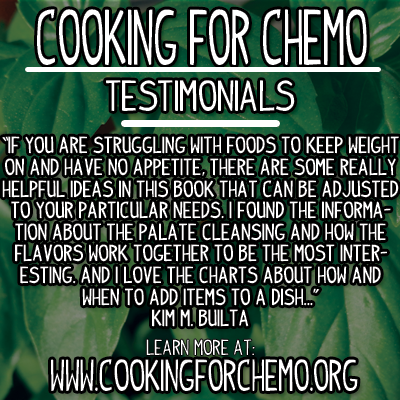 The why and how of this topic is covered in much greater detail in my book Cooking for Chemo… and After! Palate Cleansing: Palate Cleansing is an easy cooking technique where you utilize a subtle and almost imperceptible sour note in your cooking to create the illusion of lightness inside of a dish. Palate Cleansing is important! As you progress through cancer and chemotherapy, the treatment side-effects become stronger. You can develop a very strong metallic taste in your mouth that over powers the actual taste of your food and sometimes even lose the ability to taste anything but metal. Palate Cleansing is an easy to use cooking technique for waking up those taste buds and clearing out that metallic taste from your mouth. Palate Cleansing is also a great way to make heavier foods feel light in your mouth which allows you to eat more nutrient dense food without feeling ill or disgusted while you eat them. Simply add 1-2 tablespoons of red wine vinegar to your food when cooking. Sour flavors should always be followed by a bit of sugar to mask the actual sour flavor. Great food items for Palate Cleansing include: Vinegars, Citrus Fruits, Parsley, Cilantro, and so much more! Sanitation: You have to keep your kitchen and your home clean! Cancer and chemotherapy treatments kill your auto-immune system. A dirty home or kitchen is the fastest way to other illnesses like food poisoning. You want to make certain to sterilize every kitchen and cooking surface before, during, and after cancer treatments. Even your refrigerator needs to be sanitized with a disinfectant like a bleach and water solution. After all, your fridge is where you store your food!